Bradley Manning was sentenced to 35 years today. The Government asked for 60. The maximum was 90. He will be eligible for parole after 1/3. He gets credit for the time already served. He also will get another 112 days of credit for the harsh conditions he endured during in the early days of his confinement. Bradley Manning has pleaded guilty to ten counts in the Wikileaks case, and faces up to 20 years in prison. He is expected to be sentenced to 20 years in prison after his conviction on charges related to the misuse of classified information. He is scheduled to stand trial in June on 12 more serious charges, including aiding the enemy and espionage. A conviction on those probably would lead to a life sentence. In pleading guilty, Manning read from a 35 page statement explaining his motives. "The United States must vow it will not pursue journalists for shining a light on the secret crimes of the powerful"
Wikileaks' founder Julian Assange is scheduled to give a statement today at 2pm London time from the Ecuadoran embassy. How Will Julian Assange Get Out of the Embassy? Some experts weigh in with some possibilities on how Julian Assange will get out of the Ecuadoran Embassy in London and whether Britain would revoke Ecaudor's status under a little if ever used law and go in and seize him. Ecuador could name Assange its representative to the United Nations. That would make him immune from arrest while traveling to U.N. meetings around the world. Assange could be stripped of his role as representative by the U.N. General Assembly, but in the meantime would be protected. Ecuador has granted asylum to Julian Assange of Wikiliaks. “There are indications to presume that there could be political persecution,” and that Mr. Assange would not get a fair trial in the United States and could face the death penalty there. The Supreme Court of Great Britain has denied the request of Wikileaks founder Julian Assange to reconsider its May 30 order rejecting his appeal of a lower court's extradition order. A press release explaining the May 30 order is here. Today's order is here. The extradition order takes effect 14 days from today. Assange could apply for relief to the European Court of Human Rights (ECHR) in Strasbourg, but experts say it's unlikely he would prevail. According to Fair Trials International, Assange is likely to be kept in pre-trial detention once he reaches Sweden. Wikileaks founder Julian Assange has lost his appeal on extradition to Sweden. The British Supreme Court says he can be extradited to face charges there. In a 5-2 vote, the British Supreme Court upheld the validity of an arrest warrant made by a Swedish prosecutor to question Assange over accusations by two Swedish women that he sexually assaulted them. 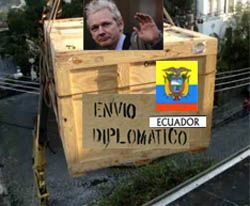 The leaked Stratfor e-mails contain one by Fred Burton of Stratfor a year ago saying the U.S. has a sealed Indictment for Julian Assanage. We have a sealed indictment on Assange. Here's Wikileak's announcement about its publication of more than 5 million Strator e-mails. The e-mails were obtained in December by activists associated with Anonymous. A federal judge in Virginia has refused to stay a federal subpoena issued to Twitter for three user accounts associated with Wikileaks. The opinion is here. Birgitta Jonsdottir, Jacob Appelbaum and Rop Gonggrijp had asked the Court to stay the subpoena pending an appeals court challenge. A federal magistrate judge upheld the subpoenas in November. The [Magistrate]Judge rejected the users' claims under the First Amendment and Fourth Amendment as well as their other arguments. She says there is no right of privacy in your IP address if you turn it over to a third party like Twitter. Wikileaks has said in the past it believes similar subpoenas went out to Google and Facebook. An appeals court in Great Britain has refused to invalidate Sweden's extradition warrant for Wikileaks founder Julian Assange. He now has two weeks to appeal to the country's highest court. Wired Magazine has released the full version of the instant messaging chat logs of Wikileaks suspect Pvt. Bradley Manning and Adrian Lamo. Previously, Wired had published only portions of the logs, due to Manning's privacy interests. It's changed its mind. Why? [I]ndependent reporting elsewhere has tipped the scale in favor of publishing. By all evidence, Manning is a figure of historic importance. Inasmuch as the conversations shed light on the personal pressures in Manning’s life at the time of his arrest, publishing the logs serves a valid news interest, and at this point we believe it will cause little additional harm to Manning’s privacy. In the wake of a massive disclosure of Guantanamo files by WikiLeaks, the FBI yesterday served a Grand Jury subpoena in Boston on a Cambridge resident, compelling his appearance to testify in Alexandria, Virgina. Alexandria is where a Grand Jury has been convened to criminally investigate WikiLeaks and Julian Assange and determine whether an indictment against them is warranted. The individual served has been publicly linked to the WikiLeaks case, and it is highly likely that the Subpoena was issued in connection with that investigation. In a 21 page opinion, U.S. Magistrate Judge Theresa Buchanan in the Eastern District of Virginia today upheld a federal grand jury subpoena issued in December for twitter user account information related to the Wikileaks probe. The U.S. District Court for the Eastern District of Virginia issued a subpoena ordering Twitter Inc. to hand over private messages, billing information, telephone numbers and connection records of accounts run by Assange and others....The subpoena, dated Dec. 14, asked for information dating back to November 1, 2009. He was charged in May with 12 counts of illegally downloading and sharing classified material, including a secret video and military and diplomatic documents.